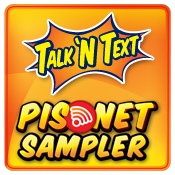 Guys have you tried this free internet surfing sampler from Talk N Text called PISONET? If not, you better check this out if you want access or surf over the net using your mobile phone along with your TNT SIM. No tricks or proxy need to configure this, it's simply a promo sampler that give free 5 hours browsing for only 1 peso. This promo is valid for 2 days in a one time use, just spare your P1 balance to try this PISONET. How to register to PISONET Promo? Once registered, you can now browse and access internet using your browser or any other internet need apps like Opera Mini, Facebook, Twitter, Instagram and more.If ever Talk N Text will roll out this PISONET promo this could be the lowest internet browsing rate compared to Smart, Sun Cellular, Globe and TM. Tips for you guys when using this sampler, just use Opera Mini or UC browser as this renders good quality compressed data to maximize the bandwidth limit allocated. Do note also that speed may vary depending on the signal and handset capability in terms of handling wireless cellular networks. Does it have promo expiration date?